This week was a light workout week due to the practice Sprint Distance triathlon scheduled for the weekend. I had a check up with Dr. Rabbetz and he said the magic words, "You're all better!" I am not sure who felt better about me being 100% healed!- me or him. He said something like, "It makes me so happy when I see my patients all better and me being able to help them do whatever they want..you're all fixed..see you in two months!" Sweet! I am sure my insurance company will be pretty happy about that as well! Earlier this year, when I was on the twice a week plan with Dr. Rabbetz, I actually received a letter from my insurance company asking me how I got injured and if there is a third party involved. No, there wasn't! It was just me..oppsy! We had Iron University Part 2 on Saturday. My two key take aways from that was 1. I need more sleep. 2. I need to consume for protein before my workouts in the morning. I'll give those two a try and see how that goes! 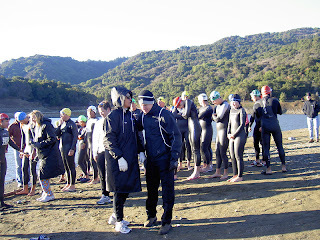 Sunday..our practice triathlon..could it be any colder?! Of Summer 06, Spring 07, Summer 07 and Ironteam seasons to date, there's only been two times when I actually wanted to maybe cry on my bike. The first time was during Spring 07 on one of our long bike rides. We rode Nicasio Valley..it was about a 60 miler I want to say? It was windy, gloomy, cold, windy and just plain miserable! For some reason mid-way through the ride, everything from the hip down was just in pain! Mark Smith was doing SAG that day and everytime he drove by, part of me really wanted to wave him down for a ride to my car but a larger part of me always said no no no..you're finishing! I was glad that I wasn't the only one to have a bad day on that ride, the amount of people that dropped F-bombs as they finished the ride was pretty amusing! The second time I wanted to cry during a bike ride was today at the practice triathlon and that was because my toes were in pure pain from being frozen! Well, today wasn't nearly as bad as that time during Spring 07, that would have been an all out boo hoo hoo cry. This time would have just maybe been a weak whiny wimpy "my toes are frozen" type of cry. Temperatures at 7:30am was quite frigid- air temperature was 39 degrees! We went off in three waves determined by Ironman event. The swim was short but just long enough for your toes to start losing feeling. Between the bike and the run, I am not sure which experience was more unpleasant. With the air temperature the way it was, my toes and fingers went numb during the 12 mile bike ride! Hez (fellow Ironteam member) and I kept saying to each other, "Hurry up! Let's just get this over with!" During the 12 miles, I kept trying to move my toes but they were too numb to even budge! You could have stuck a needle in my toes and I probably wouldn't have been able to feel it. I am not sure which is worse- riding 12 miles with numb painful toes OR riding 45 miles with a bee sting to my left eye (during a training ride in Aug 07). My fingers were barely able to grip on the brakes during descends but I managed. By the time I started my run, both my toes and my ankles went numb. I rolled my ankle twice because I couldn't feel the foundation of the ground. Walked about half the run because of the numbness..yes it was that bad! About 1.5 miles into it, I was finally able to feel my toes again! Yes, it was frigid this morning but it could have been worse. It could have been 39 degrees AND raining! Now, that would have REALLY sucked! Below are two pictures from the practice triathlon. 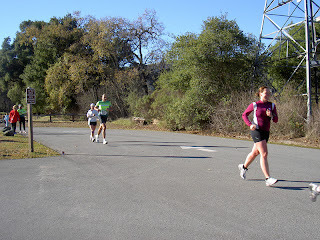 I am wearing a neon green swim cap on the left side of the picture- This picture was taken during the run- the shoe you see on the right hand side of the picture in front of Hez..that's my shoe! As Hez and I were running.. we noticed something rather funny and scary.. a sign by the reservoir which read "No swimming. No wading." We thought....hmm? ?